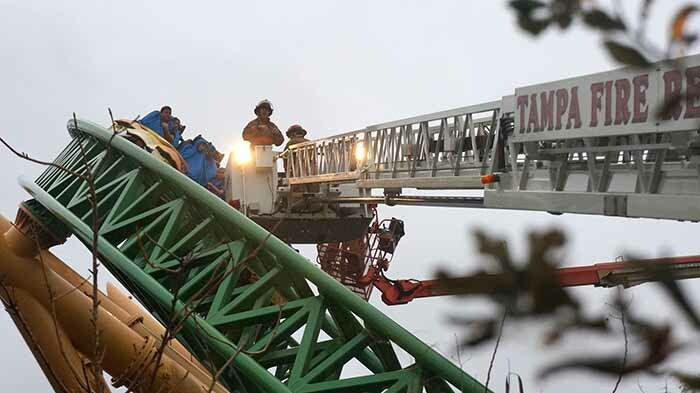 InSanity lurks Inside: Breaking News: Busch Gardens Tampa's Cheetah Hunt Stuck! Breaking News: Busch Gardens Tampa's Cheetah Hunt Stuck! MyFox Tampa Bay is reporting that Busch Gardens Tampa's newest coaster, Cheetah Hunt, has become stuck with riders still aboard. The riders became stuck at the top of the first hill after the station launch around 4:30pm and as of 5:50 they were still on the ride. Tampa Fire and Rescue are on the scene to help with the evacuation, but due to the location of the track they are having a hard time getting to the riders to assist them. To complicate matters, it's apparently raining pretty good in the area as well. Back when +Carrie H.C. and I were at the park for Howl-O-Scream, we witnessed a similar event where the train slowed considerably over this portion of the track, with the train barely making it over. At that time it was stopped in the trench before the second, bigger launch. I'm not sure what the issue is here, but it's possible that weight and/or slick tracks could lead to the trains not getting a big enough push out of the station launch area. We'll definitely be keeping our eyes on this one as things develop further! UPDATE 6:09pm: The 16 riders have been successfully evacuated from the ride. Until then here's another picture that was sent in from the scene as rescue workers attempt to free the stranded riders.